These sweet butterflies are SO beautiful-- my pictures don't do them justice! We completed them as part of our Bug Theme- Weekly Home Preschool. 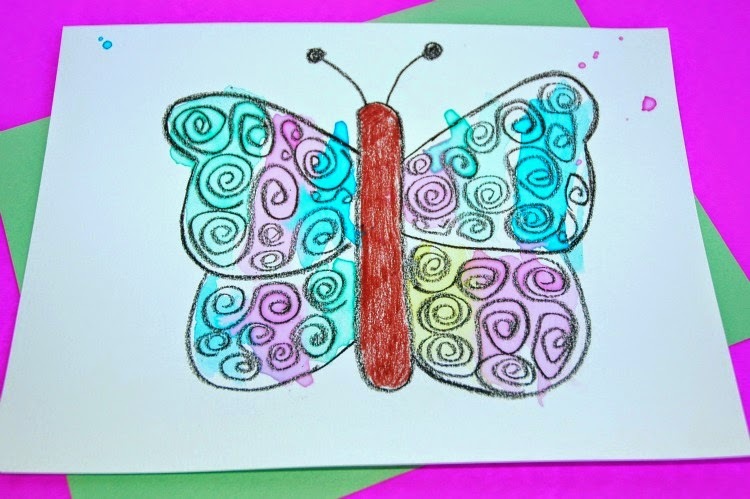 Crayon and watercolor resist is a great process for children to do. It's very forgiving, and usually turns out great results. 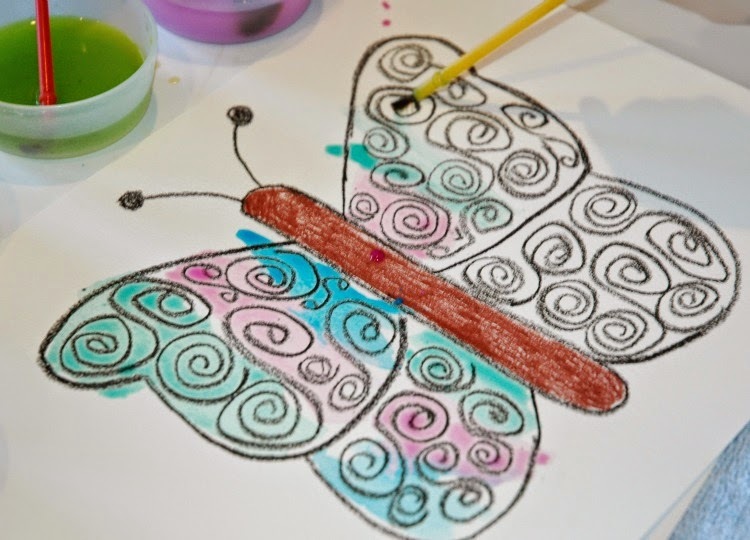 These pretty butterflies are also really fast to make, and require simple materials. Let's get to it! For this project to turn out well, you'll need watercolor paper. Trust me-- it makes a huge difference. 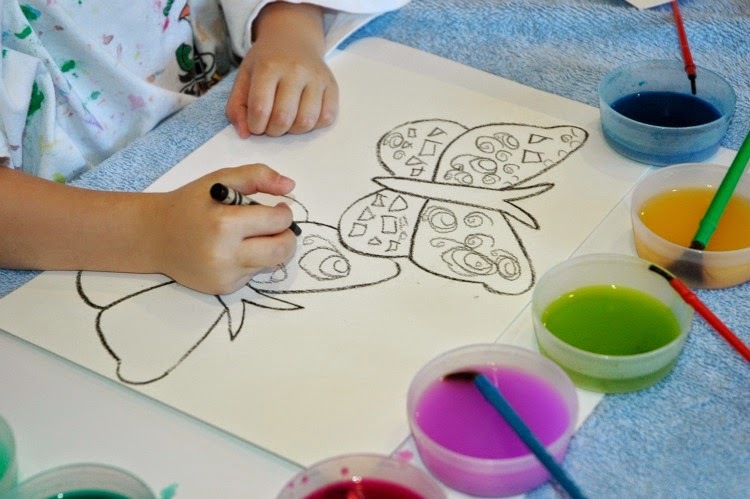 Draw a butterfly using a NON-WASHABLE black crayon. 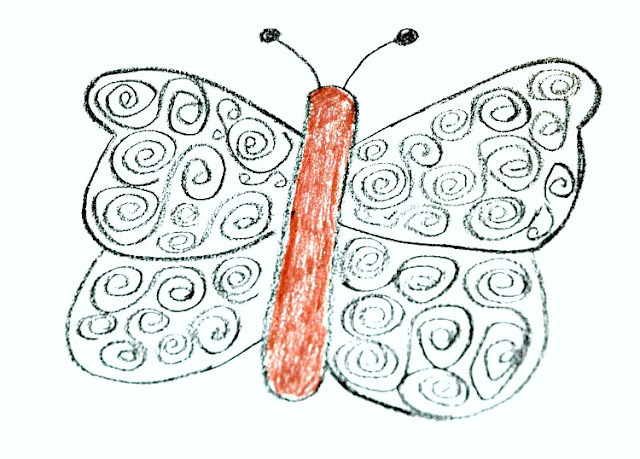 I printed and then traced the butterfly template here on Activity Village for the small butterflies, and just resized it for the large butterflies. After you have an outline, fill it in with designs. I used swirlies. Lena made shapes. Draw whatever floats your boat, just make sure to press down as firmly as you can with the black crayon. Next, all you have to do is paint over the butterflies with watercolor! I prefer to mix up some liquid watercolors by dissolving a small amount (about 1/2 of a "cake") of Crayola Watercolor in warm water (1/3 cup). It makes it easier for kids to get a good, vibrant color. You can also purchase liquid watercolors already made, or go with traditional watercolor cakes. That's it-- couldn't be easier! 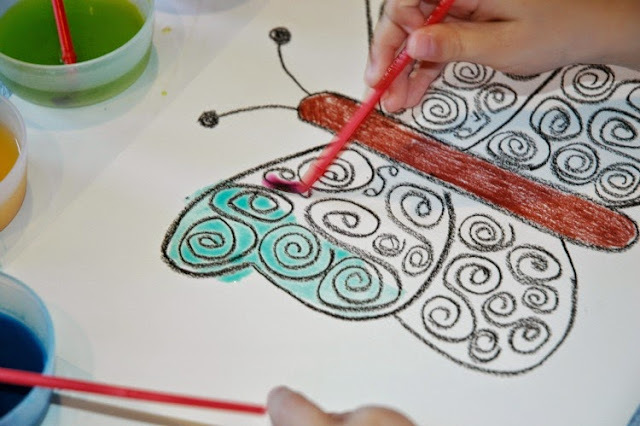 Check out the What Can We Do With Paper And Glue Pinterest board below for more preschool craft and learning ideas about bees, butterflies, and other bugs. 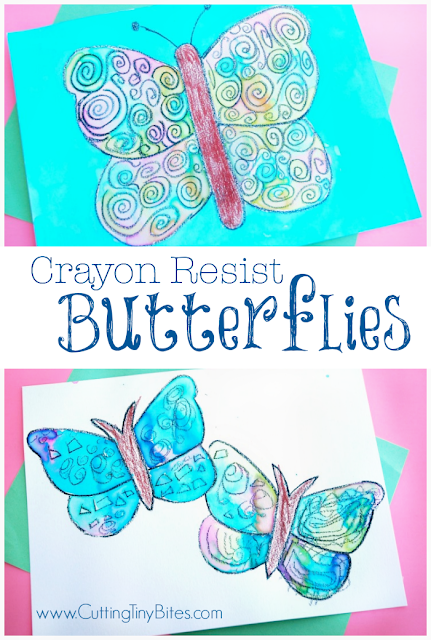 Crayon Resist Butterfly Art. Lovely watercolor technique, perfect craft for preschool or kindergarten insect theme unit.